I get a fair number of emails about our holdfasts. 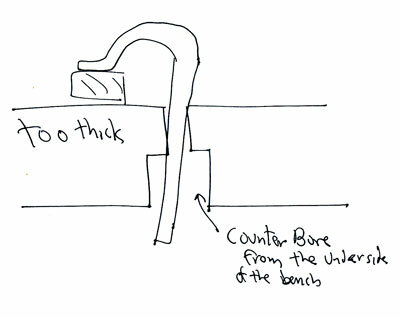 People are worried that their bench is either too thick or too thin and they aren't sure if they will work. I have two benches. One is 1 7/8" thick, the other is 3" thick.The holdfasts work fine in both benches. With much thinner or much thicker benches you might have an issue but in the years selling holdfasts I think we have never had a case where they could not be made to work. Maybe once. When you first receive the holdfasts take some coarse sandpaper (80-100 or so grit) and go round and round the stems. Round and round NOT up and down. This will remove any grease from manufacture but more importantly scratch a series of fine lines around the stems which really real help the holdfasts to grip. The holes in the workbenches should always be 3/4" - which is just about the standard hole size for most workbench accessories. To tighten a holdfast so that it clamps whack the top of the crook. To loosen whack the back of the stem while pulling upon the crook with your free hand. 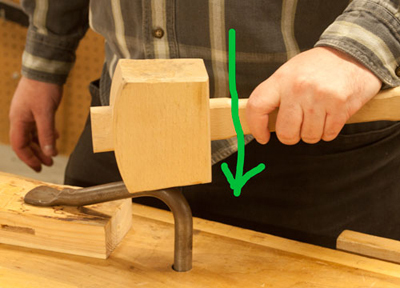 The way holdfasts work is that when hammered down to clamp they are just loose enough in the hole in the bench top so that they they wedge in. If the the angle the stem of the holdfast makes as it wedges in the hole is too shallow you won't get a good wedging action. 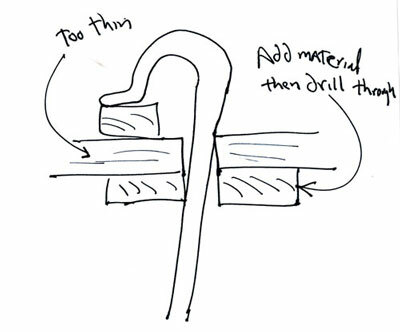 Too loose in the hole, the wedging angle will be too steep to grip. 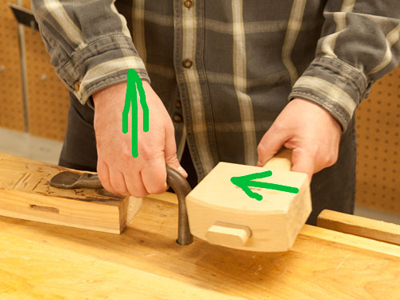 If the bench is thin and the holdfasts don't really want to grip just attach a bit of wood under the bench when the holes are, drill through, and you have effectively made the bench thicker where the holdfast holes are. For a very thick bench, counter-boring the holes from the bottom work great. All you need is a little relief, so the effective bench thickness become 2 1/2" or so. You should always test the first hole before drilling a bench by taking a bit of scrap the same material and thickness as the bench top and drilling a hole in it. 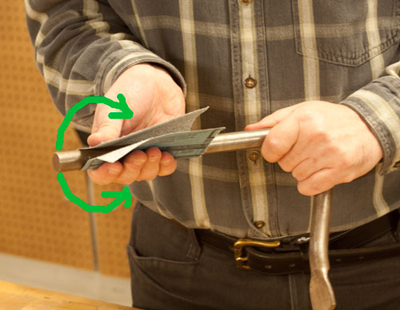 Then clamp the scrap in a vise and test it with an actual holdfast. I recommended these holdfasts to a friend who then bought a pair. After receiving them he phoned me saying that they would not hold tight. Over the phone he and I went through the possible causes and solutions to the problem. He called me back a couple of days later saying he had solved it: he had used the wrong forstner bit and the holes in his bench were 7/8", the wrong diameter. The holdfasts work as they should now but he has a few extra, extra-large holes in his bench. My bench is right around 4" thick and the holdfasts work great. I highly recommend them. Count me as a satisfied user! I bought mine in Brooklyn, so I got a hands-on demo of the sandpaper. Do it! My workbench top is 3 1/2" thick, so I counterbored some 7/8" holes from the underside of the bench and the hold downs work fine. They are very handy to use.